At Local Trust, we're testing new approaches to funding communities. This makes evaluation especially crucial: so that we can learn for the future, so that we can help residents to succeed and so we can inform and inspire others supporting communities. 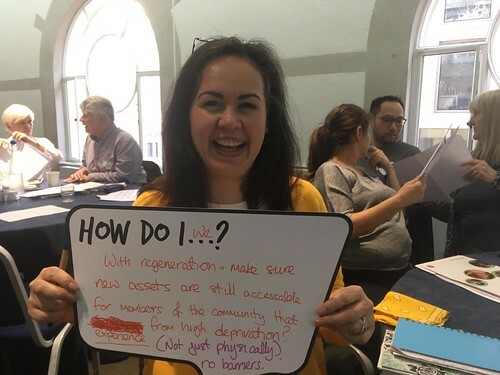 For Big Local we have an evaluation plan that explains all the ways we are researching Big Local up to the completion of the programme in 2026. Here are just a few highlights from recent findings and some news of projects in the pipeline. NCVO reviewed the progress of the first five years of Big Local and told us that 90% of Big Local partnership members feel confident that they have based their plans on what their community identified as most needed. IVAR defined how we fund for resident control: we offer time and pace, willingness to take risks, 'light touch' and flexible support, and sustainability through making investments in communities and maximising assets. IVAR also looked at how we build on assets. CDF reported on how Big Local areas are delivering their plans: using commissioning, co-working, co-creating and bidding processes. They also identified six roles that are helping shared leadership succeed in Big Local. How are residents engaging other local people in improving their Big Local area? What works and what doesn’t? What different kinds of impact are occurring in Big Local areas and at what level? How effective is the learning and training support that we offer to residents? How are Big Local areas working with health agencies? The Third Sector Research Centre at University of Birmingham are leading the first stage of a 10-year multimedia evaluation of Big Local. They have trained residents in 15 Big Local areas to capture video, podcasts and images of the changes they are seeing in their community. Some of the films produced so far are on the Our Bigger Story playlist on our YouTube channel and you can also visit the Our Bigger Story website. The School for Public Health Research are studying a sample of Big Local areas over at least three years to find out whether community health and wellbeing increases when local people have greater control over decisions to improve their area. Find out more. Recently several areas have set up community research projects with universities. We want to support all research in Big Local areas so we’ve launched a Big Local research group on Facebook. It’s a place where Big Local residents can get in touch with researchers, and vice-versa, encouraging people to work together to research issues of interest to communities in a collaborative way. Join the group and spread the word! All the published research and evaluation about Big Local is available in the research section of our website.